Healthy Ireland, a Government-led initiative, is the national strategy to improve health and wellbeing, placing a focus on prevention, individual awareness and keeping people healthy for longer. Sligo County Libraries are currently delivering the nationwide Healthy Ireland at Your Library programme that will establish libraries as a valuable source within the community for health information. Funding granted by Healthy Ireland at Your Library has enhanced health and wellbeing book collections (digital and hardcopy), and provided for staff training, events, and promotion. The programme will enhance current health information available from Sligo County Libraries through the provision of a new collection of books, e-Books, e-Audiobooks, e-Magazines, e-Newspapers & online courses on health and wellbeing. 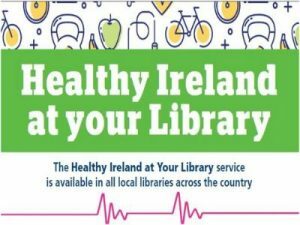 The Healthy Ireland at Your Library Book Stock and online resources will be complimented by a range of events with a focus on physical health, mental health and health literacy. It contains a collection of books on health and wellbeing, all available to borrow from any branch of Sligo County Libraries.